Step right up folks and get the amazing wonder drug. It cures earaches, psoriasis, tapeworms, and thrush. This little magical health grenade has been linked with lowering blood pressure, regulating blood sugar, preventing heart disease, and fighting off cancer. It is a natural antibiotic to which your body does not become immune - in fact, it boosts immunity -and has anti-fungal as well as anti-viral properties. This sounds too good to be true, so how much does it cost for all this power packed in one super drug? About $.49 (or less if it's on sale) for a whole bulb. Garlic is nature's wonder drug. I love the stuff, the smell, the taste, everything about it. What man made drug can have these amazing attributes? And even if there was one, how much would it cost? I try to put garlic in almost everything we have for supper and that includes our dogs' food. 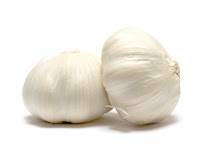 From personal experience I know that garlic gets rid of warts on humans and canines. Just slice or crush a clove of garlic and tape it too the wart. Leave it overnight, take it off and within a day or two, the wart will just go away. For dogs, just put it in their food for a few days and they will go away - the warts, not the dogs. All in all, very practical. I love garlic. So glad to know it has so many benefits as well! Me too! It is truly a wonder. So that's why my boys never had earaches when they were being breastfed! Seriously, I can't get enough of garlic. And now I can say it's because of the health benefits. I'm attempting to grow garlic this year in my garden. Fingers crossed! Good luck growing it in the garden. I want to grow it in ours this year as well. I had tried too early in the season last time so I'm hoping for a better result this time. :) Thanks for stopping by.